Visitors coming to Kenchanahalli get curious about the coconut tree with a cement plaster around its trunk. We are fond of telling them the story of how it happened. As the hospital was getting built, we felt that each member had to be emotionally linked to the hospital. The cost of a coconut sapling was around Rs.8 then. Each of the 100 or so members decided to contribute and we planted around 100 saplings all round the campus. But one night, one of our regular visitors, a mother elephant with her young one, managed to uproot most of them and we were left with around 32 plants to worry about. Just about then, we got the fence electrified and hoped that this would deter this elephant from troubling us. But it was not to be. On that eventful day, Sindhu Suresh was with us at Kenchanahalli. Around midnight or so, we heard the customary noises of our nocturnal friend. Seetharam and Vivek were determined not to lose any more plants to her voracious appetite. All 4 of us rushed out hoping to make enough noise and frighten the elephant away. As we tried doing so, she charged at us. And we ran back to the house (where Bindu and I lived later) for dear life. What we did not realize was that Sindhu was the first one to have run away and she had already rushed back to the house. In sheer panic, she had locked the door from inside, leaving the rest of us at the mercy of the elephant. We were left wondering who would be the first one to find the elephant’s feet. Thankfully, the elephant found one of the coconut trees beside the house more interesting than any of us. She plucked it out and casually cast it aside. All this noise and disturbance must have spoilt her appetite and she returned back to her forest. 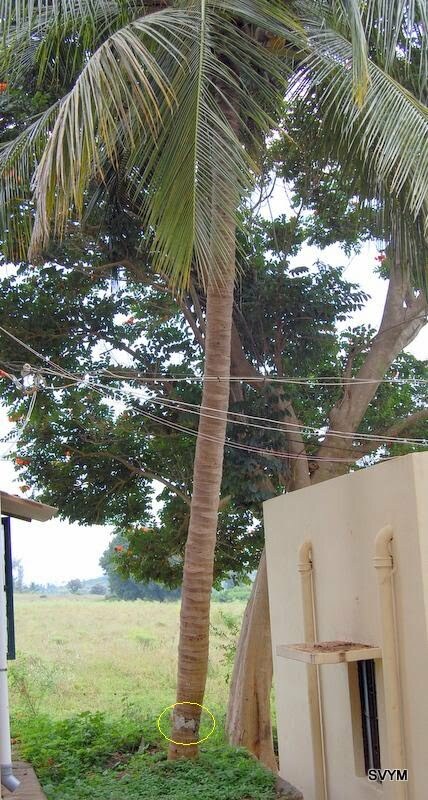 Seetharam was very upset on seeing the coconut tree lying lifeless. He decided to resuscitate it and had it replanted. To support the plant, he prepared a splint with wooden rafters and cemented the injured area. Miraculously, this tree survived and pulled through. Today it stands tall and yields plenty of nuts too, but the cemented scar remains. We are fond of calling it ‘Seetharam’s tree’. This was the first evidence we all had that he was being prepared for the life of an orthopedic surgeon. Today, Seetharam has graduated from coconut trees to real humans and he continues his job of mending broken bones! Next Article The blog unites me with a friend!